Hello! Mojo Monday is having a huge celebration this week in honor of their 300th sketch, so I decided to play along. I bought this MFT image and die a long time ago and never used it, so I decided it was time to get her inky. I replaced the circle element in the sketch with the artist palette die. The paper is from Amy Tangerine. Super sweet card Amy, and what a wonderful idea to add the paint pallet. Love it! Gosh this is just adorable!! Love the colors and design. The card is fabulous! Love that image and your colouring is wonderful! Fabulous papers just perfect for this card! The palette behind the image is so cute!! Fun card!! Such a cute card Amy! Love her rosy cheeks! This is fabulous, Amy! 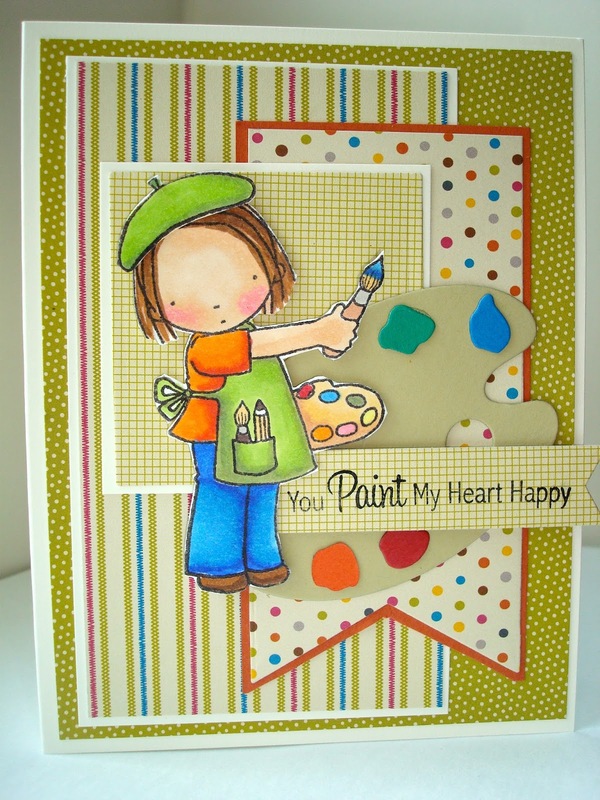 Love how you incorporated the palette! I'm so glad I stopped by your blog and discovered how close we live to each other, I'm from Ellsworth!